Commitment. It's something I've struggled with my entire life. Case in point: I'm writing this entry for Day 4 on Day 6. Second case in point: After giving up sweets for Lent, I helped myself to a slice of carrot cake yesterday. Catholic guilt set in, but not enough to stop me from eating it. My laissez faire attitude has been getting to me this week. As I sit here trying to write about how I can't commit, I let myself get preoccupied with making the final touches on my wedding invitations. It's then that I stop harping on about my inability to keep something up because I'm reminded that there's one commitment that is undisputedly that biggest commitment of all that I am gearing up for: my wedding. According to my wedding app (that I check far too often), I have 144 more days until I get to marry Tom. He's amazing, but I'll save that for another post. It's here that I move on because I'm reminded that I'm committing myself to a man who accepts me even when I'm inconsistent. Today, that's all I need to know. There's something about conversing with a child..
A first grade student popped into my office today. He had a band-aid on behind his ear so I asked, "What happened to your ear?" "One of the 5 B's. Either you're barfing, got a bee sting, bloody, I can't remember or bullied." I'm still not sure what happened to his ear. Today was just like any other day. The 2nd graders left the lunchroom and we proceeded out the front door of the school just as we had done many times before. Today was not like any other day when one child (followed by three then five then ten) decided to scream, yell and sprint out of the building, as if they were running into an amusement park. What is going on? I screamed (I don't scream). And when you're screaming at children, you've already lost. I gave up the rights to my own classroom when I decided to take the role of the Literacy Coach three years ago. Classroom management was my specialty. I became an expert on management during my second year of teaching when my weakness in that area came to light my first year. Today, after screaming at eighty 7/8 year olds, I couldn't help but wonder, am I losing my touch? My 2nd grade is special to me. It offers me the opportunity to observe the inner-workings of the social life of children. I cherish the conversations I have with them and the opportunity to build relationships. It fulfills a part of me that I long for after not having a class to call my own. I will bring my best teacher self back to recess tomorrow. As I tell my 2nd grade recess students, tomorrow we can try again. In front of me sits a group of six 5th grade students, all first generation Mexican Americans. We are reading an article about the threat of The Wall. My eyes well up as I watch them search for main ideas throughout the text because today might reach a more personal level for some of them. Questions are asked. Opinions are shared. More questions are asked. More opinions shared. And I think to myself, well isn't this what public school in America is all about? 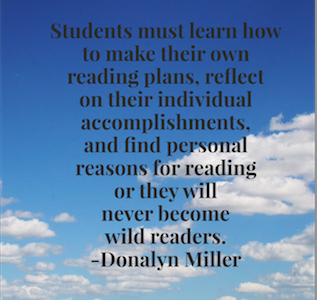 We are continuing our #D100bloggerPD book study on Donalyn Miller's book Reading in the Wild. If this is your first stop in the book study, be sure to check out Kristin Richey's blog Reading and Owl of the Above to read all the previous posts. Last January I wanted to become a more habitual writer, so I bought a blog template in hopes of chronicling my journey as a literacy coach. What I failed to do was make a plan or set goals for myself in order to make writing a habit. I didn't preplan to write. Heck, I didn't put any plan in place at all. So here I am, two months shy of a year, finally sitting down to write again. 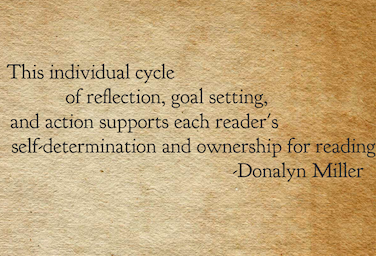 In Chapter 5: Wild Readers Have Reading Plans, Donalyn Miller discusses the importance of making short-term and long-term reading plans in order to sustain and expand a ongoing reading life (or writing life in my case). Not only should a "wild reader" set personal goals, but also identify areas that one would like to improve in or enrich. The key to success is reflection- reflect on plans made and reflect on what worked and what didn't. We're familiar with the idea of setting long-term and short-term reading goals, but what can we do to ensure that are students keep their commitment to reading?? Miller offers two types of plans to help students maintain solid reading behaviors. Commitment plans help build a strong foundation for reading HABITS. Students need to be personally committed to daily reading. Without the intrinsic motivating forces, the drive is eventually going to stop. How do we get students to make reading part of their daily life and have success with their reading plan? Increasing Book Completion - set small, attainable goals with students allows them to be successful quickly...this will help them make positive associations with reading, which motivates them to want to read more! Challenge Plans allow students to set AMBITIOUS GOALS for themselves to fill gaps in their reading life. The challenge is not meant to ignite competition between readers or groups of readers, but rather allows readers opportunities to push themselves to go outside of their genre comfort zone or try amp up their volume of reading. Some examples of challenge plans include the Book-A-Day Challenge (read one book for every day of your summer vacation) and Book Gap Challenge (stretch your reading preference to include series or award winners that you wouldn't normally tackle). Rarely do we ever pick up a book cold turkey and expect ourselves to devour it so why would be expect anything different from our kids? In order to cultivate voracious readers in our classrooms, we need start or continue to give our readers opportunities to hear book recommendations from other classmates or adults. Our Vice Principal, a voracious reader herself, will often go into classroom to give book talks to students. By just designating a few minutes a day or week for book talks, you can feed students motivation to read with a few book suggestions. Encourage students to keep lists of books they would like to read, hold a book swap, or host a library card sign-up event. As a former classroom teacher and reading specialist, I understand the fine line we walk to keep kids accountable for their reading while allowing them the freedom of choice. There's the constant struggle to get kids to stick with a book long enough to finish it. In order to get kids to be the type of readers we hope - the Wild Readers- we need to reflect on our teaching. Are we giving our readers the opportunity to plan and set their own goals? The key to success may just lie in handing the ownership back to the kids. Allow time for them to set personal goals and to reflect on what went well and what didn't go so well. Our innate desire for accountability can be holding students to their personal goals when we confer. This calls for organization and constantly updating your conferring calendar. By giving the students the responsibility to determine their own reading goals and plans, reading can become personal. Now back to my own plan. To stay in touch with the blog book study, be sure to follow #D100bloggerPD on Twitter and check out The Bazz Blog, my fabulous Assistant Principal at Pershing, on Monday 12/7 for the next post! This morning I had the pleasure of co-presenting with the uber-brilliant Leah O'Donnell. Follow her blog here. Her intelligence exceeds mine, so every time I present with her I consequently appear to be more knowledgable than I actually am. But I will give all the credit where credit is due. In this case, all the credit to my post belongs to her. The title of our PD was "Close Reading to Transition to Book Clubs"; two topics that do not often sit well with teachers. Since my last post was dedicated to close reading, I'm choosing to focus mostly on book clubs this time around. How can we get our students to the point where they are able to independently engage in a quality book club? Here a few things to consider implementing NOW in order to adequately prepare your kids for accountable conversation and higher level thinking. You already have taught a boatload of comprehension strategies. Consider integrating some CCSS speaking and listening standards that you might need to address as you continue to teach comprehension strategies. Get the kids to practice the strategy of listening and appropriately responding. This can be done during your morning meeting, in line for the bathroom, or while teaching another content area. Keep in mind that the speaking and listening standards transcend all areas of the curriculum, and should not just be reserved for your literacy instruction. Pepper in conversation mini lessons throughout your unit. Engage kids in conversation during your small groups in reading. Begin having kids share out to their partners during your designated share time within your reading workshop. Make conversations meaningful in your classroom. As you incorporate the CCSS Speaking and Listening standards, begin to teach this formula to your students. It's less important that a student names what she's doing than just naturally begins to think and converse in this way. This is an integral part of the independent piece to book clubs. Kids need to be able to take an idea and expand on it, not just spew out their thoughts from their post-its. This needs to be explicitly taught and modeled. In order to grow ideas, kids need to employ reading strategies that may or may not have been previously taught. It's a good rule of thumb to always go back to the CCSS Reading standards to see what your final goal should be for your grade level. Consider unpacking the standards with your literacy coach as your guide. Close reading (as I have preached about in the past) is the act of student making meaning and gathering a deeper understanding of something that is read/heard/viewed independently. Close reading is a strategy that should be taught explicitly (Read with a Lens/Identify Patterns/Make Interpretations), but sparingly. I advise you to start with something engaging (like the close reading of a pop song) when introducing it to a class for the first time. The whole idea in close reading is to get a kid to that a-ha moment when she realize for the first time that life (or maybe in her case, her favorite song) has layers of meaning. The idea is to get a student to question and not take everything she comes across at face value. And I beg you, please don't use close reading as a test-prep strategy. It is almost guaranteed that a student will remember the time she realized that her favorite song was not actually about a lion, but rather a rally cry for self-empowerment over the time when she reread an article on hibernating black bears in northern Wisconsin. I'm not saying there isn't value in this style of close reading, just make sure you've got the kids' attention before using it for your own agenda. Finally, be wary of overusing this strategy. It should only be done 4-6 times within a given unit. You have been warned. Group students into permanent partnerships. This is a good use of time for many reason, a few of which I will list here: 1) A student knows exactly whom they should pair up with for a turn and talk during your mini lesson 2) You can create permanent seating arrangements based on the pairings 3) When it comes time to share, students know exactly whom they are supposed to be sharing with. Bottom line: it saves a substantial amount of time in the long run. There is a lot more to be said on the topic of book clubs. The aforementioned is food for thought. If you do anything at all, try to implement more accountable talk within your mini lessons and meeting time. Book clubs are arguably the best part of teaching. You can get your kids to share-worthy book club status by adequately preparing them. Start now and you will be absolutely see the fruits of your labor come April/May. This structure really allows the teacher to make it our own. You can identify whatever lens you feel your class or small group needs and create engaging lessons from there. In order to teach close reading and get the students to actually make it a habit, you must engage in repetition of the act BUT be careful not to overkill the act. It is recommended that you teach the technique of close reading 4-6 times per unit. That is all. It's not a topic fit to create a unit around, but merely a method to get kids to create new meaning from texts, media, video, songs, etc. As we ready ourselves to begin teaching close reading in our classrooms, we need to think about our students. What will engage them? Lyrics to a pop song? A gross article about the human body? The most wonderful thing I heard yesterday (and I heard a lot of wonderfuls) was that we have to allow our students to take an intellectual risk in order to develop new thinking. Are you allowing your students to take that intellectual risk? If you ever have the chance to hear Chris Lehman and Kate Roberts speak, please do yourself a favor and go. They will gladly sign your book and take a picture with you, but most importantly, they will engage you. In the meantime, you should probably go buy their book.